You simply can’t take your eyes off her. Storaro and Allen have combined to give her a cinematic beauty that makes you gasp, in a multi-faceted role that makes you applaud. She is playing Ginny, a Brooklyn waitress, who works in a Coney Island Clam House. I have known SOOOO many Ginnys in my lifetime, and British though she is, Winslet absolutely nails her Ginny to the Coney Island boardwalk. And it’s stirring performance in the grand tradition. She’s every woman. And every woman I’ve known, from Brooklyn, trying to make a better life for herself and her family. And trying to find love at the same time, having given up her dreams of being an actress earlier in her life. Winslet’s Ginny seems the simplest of creatures.. But Allen’s writing and her bravura performance proves that every woman is as complex as a whirlwind. Or a rollercoaster. Or a Wonder Wheel at Coney Island, to use this film’s great metaphor. Winslet has never seemed so bedeviled and so bewitching at the same time. She’s a housewife in waitress’ outfit that she wears like a queen, as she goes about her frantic daily work of cooking and cleaning for the whole of Brooklyn it seems. Allen and Storaro capture the ordinary woman’s extraordinariness. She is married to a lout (James Belushi) and having a torrid affair with Justin Timberlake, the local lifeguard. Timberlake’s string-bean-ness seems out of place as a life guard, but he, too, has movie star charisma in buckets instead of muscles, that make all the women in the film falling for him make sense. He and Belushi have both never been better. She is playing Ginny, a common-as-they-come Brooklyn waitress, who is as uncommon, as she is earth-bound. Winslet’s a fiery red-head this time. And in Storaro’s use of orange and amber light, she seems so on fire, she is burning up the screen. It is no surprise then that her red-headed son is an arsonist, setting a fire every time he’s left alone. The fires remind him of his mother. And Juno Temple is Belushi’s neglected daughter, who turns up as a “Marked” woman, being chased by the mob, because she married a gansta, and became a “canary” who sang on her husband, making her a woman on the run for her life. She hides out in Winslet’s and Belushi’s humble household underneath the ever-present Wonder Wheel. Young, blonde Temple has the role of her career here, too, and is doomed from the first seconds we see her taking her first tentative steps under the Wonder Wheel. In a simple car ride in a romantic rain storm with Timberlake, she becomes, as he says “as beautiful as the rain light.”Storaro has lit her in golds and blues to emphasize her beauty as well as her melancholy. She, too, is magnificent in this film. Storaro and set designer Santo Loquasto make more magic by making Coney Island in the ’50s look like the Riviera. Winslet’s performance is so heart-breaking and towering it immediately recalls the great screen performances of screen queens past. Joan Crawford in particular. The shop girl who was not a shop girl. The waitress who was not a waitress. And reminds you that not since the ’40s have actresses consistently seen parts like this. Winslet’s Ginny is the working class version of Cate Blanchett’s Jasmine in Allen’s recent Oscar winner “Blue Jasmine.” “Wonder Wheel” is his best film since “Midnight in Paris” and is now one of my favorite Woody Allen movies. It’s right up there with the best. It reminds me why I love Brooklyn. And New York City. 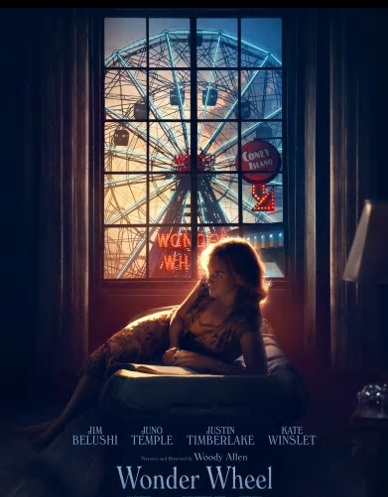 “Wonder Wheel” is a movie movie about romance and melodrama and great actresses playing great roles. And it ends this year’s superlative NYFF with a BANG!